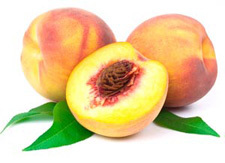 Throughout this article we will examine all you need to know about the calories in a peach. As you can expect, the number of calories in a peach will vary depending on how the peach is used, bought, or prepared. Obviously peaches that are sweetened will be drastically higher in calories than those that are consumed fresh. Furthermore, peaches placed within a cobbler or other type of baked recipe will also contain more calories than your medium-sized peach purchased at your local grocery store. We will examine the number of calories in a peach in a variety of different situations in order to encompass all you need to know about this fruit’s calorie count. First let’s examine the peaches that are purchased at your local supermarket in the different varieties. Your typical fresh peach that is medium in size will generally be about thirty-seven calories. Obviously, the larger the peach the higher the calorie count will be. Peaches that are canned with light syrup tend to be somewhere around fifty calories; however, those with heavy syrups may be around seventy-three. These calorie counts are both for a container about 3.5 ounces in size. These numbers are estimates based on multiple different brands. For a more specific count be sure to check the label of whatever brand you wish to purchase for a more accurate count. Now let’s examine the typical calories found within frequently used peach recipes and desserts found at some of your favorite restaurants. Pies and tarts that contain peaches tend to average somewhere around two hundred and sixty calories, while frozen peaches that are sweetened are around one hundred and fifty. Furthermore, peaches are found in everything you could imagine from cobbler to ice cream. For example, Old Country Buffet peach cobbler contains over two hundred calories while the fat free peach frozen yogurt without added sugar from TCBY has only seventy-two. As you can see, the method in which you prepare the fruit (sweetened or not) as well as the ingredients you add to the recipes will determine the calories you are consuming. Since we have delved into calories in a peach, let’s briefly identify a few key nutritional reasons that eating peaches is recommended. A fresh peach is relatively low in calories and has plenty of Vitamin C. However, they are also a great source of vitamins A and B as well. When you look for peaches in your local supermarket keep your eye out for ones that are soft with a sweet fragrance and a lack of blemishes. If you pick a peach that is relatively hard you can ripen it for a few days in a nearly sealed paper bag to help it advance to a ripened state. Be sure to monitor the ripeness daily to keep it from bruising and spoiling. However, if you decide to purchase peaches in a can or frozen it is recommended that you get ones without sugar added to reduce the number of calories per serving. In conclusion, peaches are extremely healthy and contain a surplus of vitamins including A, B, and C. These peaches will vary in calories depending upon the way they are consumed. Any peach with added sugar or sweetener will be higher in calories than your typical fresh peach that is only around thirty-seven. Obviously when cooking these peaches with other ingredients to make pies, tarts, cobblers, jam, etc. you will be increasing the number of calories you are consuming in a given serving. All in all, it is highly recommend that you add this fruit to your diet, which can be done with ease due to the low number of calories in a peach.